Adolescence is a crucial developmental period characterized by specific behaviors reflecting the immaturity of decision-making abilities. However, the maturation of precise cognitive processes and their neurobiological correlates at this period remain poorly understood. Here, we investigate whether a differential developmental time course of dopamine (DA) pathways during late adolescence could explain the emergence of particular executive and motivational components of goal-directed behavior. First, using a contingency degradation protocol, we demonstrate that adolescent rats display a specific deficit when the causal relationship between their actions and their consequences is changed. When the rats become adults, this deficit disappears. In contrast, actions of adolescents remain sensitive to outcome devaluation or to the influence of a pavlovian-conditioned stimulus. This aspect of cognitive maturation parallels a delayed development of the DA system, especially the mesocortical pathway involved in action adaptation to rule changes. Unlike in striatal and nucleus accumbens regions, DA fibers and DA tissue content continue to increase in the medial prefrontal cortex from juvenile to adult age. Moreover, a sustained overexpression of DA receptors is observed in the prefrontal region until the end of adolescence. These findings highlight the relationship between the emergence of specific cognitive processes, in particular the adaptation to changes in action consequences, and the delayed maturation of the mesocortical DA pathway. Similar developmental processes in humans could contribute to the adolescent vulnerability to the emergence of several psychiatric disorders characterized by decision-making deficits. Adolescence is a crucial developmental period of important physiological, neurobiological and cognitive changes. This distinct stage of life is particularly characterized by impulsivity and risk-taking and sensation-seeking behaviors, suggesting immaturity in decision-making processes (Spear, 2000; Laviola et al., 2003). Current theories attribute this behavioral pattern to differences in the maturation time course of cortical and subcortical areas (Casey et al., 2008; Ernst et al., 2009; Somerville and Casey, 2010) and their coordination (Sturman and Moghaddam, 2011b). However, few studies have directly analyzed cognitive differences between adolescent and adult subjects, so that the specific cognitive abilities appearing during adolescence and their links with brain developmental events remain largely unknown. Decision making reflects the ability to perform a choice between different options and actions according to the current goal. A wealth of recent studies has demonstrated that flexible goal-directed actions require the integration of the representation of causal action–outcome relationships with the value of outcome (Balleine and O'Doherty, 2010). In adults, several studies have demonstrated that dynamic functional interactions between prefrontal (Killcross and Coutureau, 2003; Valentin et al., 2007; Tran-Tu-Yen et al., 2009), striatal (Yin and Knowlton, 2006; Tanaka et al., 2008), and limbic (Corbit et al., 2001) regions underlie these cognitive processes. Growing evidence demonstrates that the dopamine (DA) system plays a central role in the coordination and modulation of corticostriatal loops (Costa, 2007) by differentially innervating the prefrontal cortex (mesocortical pathway), the striatum (nigrostriatal pathway), and the nucleus accumbens (mesolimbic pathway) (Björklund and Dunnett, 2007; Lammel et al., 2008). This broad innervation conveys various types of information such as prediction error (Schultz, 2000; Montague et al., 2004) or event salience (Redgrave and Gurney, 2006; Bromberg-Martin et al., 2010). Recent work has emphasized the differential contribution of cortical and subcortical DA pathways to specific goal-directed learning processes in adults (Faure et al., 2005; Hitchcott et al., 2007; Naneix et al., 2009; Lex and Hauber, 2010a). Nevertheless, a full description of the DA system maturation in relation to the emergence of specific cognitive aspects is still lacking. It could therefore constitute a crucial milestone in the transition toward adult cognitive functioning. To address these issues, we have assessed here the relationship between the development of goal-directed actions and the maturation of DA system during adolescence. In Experiment 1, we have used specific instrumental learning procedures to compare decision-making abilities of adolescent and adult rats depending on action–outcome causal relationships (contingency degradation procedure), outcome value (outcome devaluation procedure), or outcome-associated stimuli (pavlovian-to-instrumental transfer; PIT). In Experiment 2, we investigated the parallel development of DA pathways to specific projection areas (innervation density, DA concentration, DA receptors expression) in relation to their specific involvement in the control of instrumental actions. Litters of Long–Evans rats (Centre d'Elevage Janvier) were received between postnatal day 3 and 7 (P3 and P7) and culled to six pups per dam. Only the male offspring was used. Pups were housed with their mother in a temperature- and humidity-controlled room, and maintained under a 12 h light/dark cycle (light on at 7:00 A.M.). Rats weaned at P21 were randomly assigned to each experimental group and housed in pairs. Two rats per litter were used in each experimental group. The experiments took place during the light phase of the cycle. Before the behavioral experiments, animals were given ad libitum access to food and water and were handled every day. All experiments were conducted in agreement with the French (Directive 87-148, Ministère de l'Agriculture et de la Pêche) and international (Directive 86--609, November 24, 1986, European Community) legislation. Instrumental learning for contingency degradation. Throughout the duration of the experiments, rats were maintained at ≈ 90% of their normal weight. Adolescent rats were trained from P25 to P40 and adult rats from P70 to P85 using a procedure adapted to the short time window of adolescence. Adolescent and adult animals were trained in two sets of conditioning chambers (22 cm wide × 16 cm deep × 19.5 cm high or 40 × 30 × 35 cm for adolescents and adults, respectively; Imetronic) located inside sound and light-attenuating wooden chambers (Naneix et al., 2009). Initially, all rats were trained for 1 d to collect rewards in two different magazines (left: grain-based pellets; right: 0.1 ml of 20% sucrose solution) during four 30 min magazine training sessions (two sessions for each reward, 1 h apart). Rewards were delivered on a random time 60 s schedule. During the next 6 d of instrumental training, all rats were trained to press levers to obtain these rewards during four 30 min instrumental training sessions each day (two sessions for each lever-reward association, in alternating order, 1 h apart). The cage was illuminated and the lever inserted during the duration of the whole session. The rats were first trained with a fixed ratio (FR) schedule FR-1 for 1 d (i.e., each lever press was rewarded) until they earned 30 rewards for each outcome. Animals were then shifted to a random ratio (RR) schedule 5 for 1 d (RR-5, i.e., on average one reward every five lever presses), to an RR 10 schedule for 1 d (RR-10) and then to an RR 20 for 2 d (RR-20). Two 20 min sessions were given each day, one for each lever, during 8 d. During the two sessions, as in the RR-20 schedule, the probability to obtain the reward associated with the lever was 0.05 for each press. In addition, one of the two rewards was also delivered noncontingently with the same probability of 0.05 for each second without a lever press. The noncontingent reward was the same in the two sessions. Therefore, one action–outcome relationship was degraded (Degraded condition) whereas the other one was preserved (Nondegraded condition). For half of the rats, the action–pellet contingency was degraded, and for the other half the action–sucrose contingency was degraded. The same instrumental contingency was degraded when rats were adolescent or adult. Responses were subsequently tested in a 5 min choice extinction test with both levers present and no reward delivered. Outcome devaluation by sensory-specific satiety. A separate batch of rats was used to test adaptation to changes in outcome value after the same initial instrumental training. Rats were given free access to one of the two rewards in their home cage for 60 min (Devalued reward, half receiving food pellet and half receiving sucrose solution). Immediately after, the rats were tested in a 5 min choice extinction test in their operant chambers (see above). Then, the rats were given free access to each of the two rewards successively for a consumption test (15 min each). After 1 d of retraining, the other reward was devalued using a similar procedure. Another group of rats was used to test PIT during adolescence. Rats were given first pavlovian then instrumental training over 4 d. Initially, all rats were trained for 1 d to collect food pellets during two 30 min magazine training sessions. During the next 2 d of pavlovian conditioning, all rats received two daily sessions, each involving 12 presentations of a 2 min conditioned stimulus (CS+, tone or clicker counterbalanced). During each stimulus, four food pellets were delivered on a random time 30 s schedule. On day 4, the other stimulus (CS−) was presented 12 times without food during a single session. Pavlovian conditioning was followed by 3 d of instrumental conditioning (four 30 min sessions each day). Only one lever (active lever) was rewarded by food pellets, the other one (inactive lever) was without effect. Rats first received one session of training under an FR schedule (FR-1), and then they were shifted to a variable interval 30 s schedule for the rest of instrumental training. On the final day, all rats were tested for PIT under extinction. Both levers were inserted into the chamber and instrumental response was recorded in absence of food delivery for 24 min. Then, each stimulus (CS+ or CS− regarding pavlovian conditioning) was presented four times in a pseudorandom order, separated by a 2 min intertrial interval, to assess facilitation of instrumental responses. Rats were killed with an overdose of pentobarbital sodium (Ceva Santé Animale) and perfused transcardially with 0.9% NaCl solution, followed by 4% paraformaldehyde (PFA) solution in 0.1 m phosphate buffer (PB). The brains were postfixed overnight in 4% PFA and transferred to a PB 0.1 m/30% sucrose solution for 48 h at 4°C. Serial coronal sections (50 μm thick) were cut on a freezing microtome (Leica SM 2400). Free floating sections were incubated with primary mouse monoclonal antibody (anti-tyrosine hydroxylase (TH) 1/1000 or anti-dopamine-β-hydroxylase 1/10,000 in PBST 0.3% and normal goat serum 2%; Millipore Corporation) for 48 h at 4°C. Sections were then incubated with biotinylated goat anti-mouse (1/1000 in PBST 0.3%; Jackson ImmunoResearch) for 90 min at room temperature. They were then incubated with avidin—biotin–peroxidase complex (1/200 in PBS; Vector Laboratories) for 2 h at room temperature. The staining was revealed in a solution of diaminobenzidine (0.02%; Sigma-Aldrich) and hydrogen peroxide (0.07%). Labeled sections were scanned using a NanoZoomer (Hamamatsu Photonics) with 20× lens. Digital microphotographs of region of interest (ROI) in each hemisphere were examined with 5× virtual lens. Each ROI was outlined according to the Paxinos and Watson atlas (1998): anterior cingulated cortex (ACC), prelimbic cortex (PLC), infralimbic cortex (ILC), dorsomedial striatum (DMS), dorsolateral striatum (DLS), and nucleus accumbens (NAc). Quantification was performed using an automated method developed in the laboratory with ImageJ software (Naneix et al., 2009). Briefly, the digitized microphotograph was smoothed with a Gaussian filter (diameter 20 pixels) and subtracted from the original picture (background) to isolate high spatial frequencies. The picture was then subjected to a fixed threshold to extract stained elements. The relative volume occupied by fibers was estimated by the proportion of detected pixels in ROI then normalized with respect to control group levels. Tissue levels of neurotransmitters and metabolites were quantified by HPLC with electrochemical detection (HPLC-ED) as described in Parrot et al. (2011). Brains were quickly removed and ROIs were handily dissected and snap-frozen until RNA extraction. Total RNA was isolated by using an RNeasy Lipid Tissue Kit (Qiagen). RNA concentration and integrity was measured using a Nanodrop 1000 (Thermo Scientific) and Experion RNA HighSens Analysis kit (Bio-Rad). cDNA was synthesized using 50 ng of RNA and iScript cDNA Synthesis kit (Bio-Rad). Reaction with RNA without reverse transcriptase was performed to check for genomic DNA contamination. Expression levels of genes of interest were determined by quantitative real-time PCR (qPCR) on a CFX96 thermal cycler using iQ SYBR Green Supermix (Bio-Rad). qPCR protocol comprised 5 min at 95°C, 50 cycles of 20 s at 95°C, 30 s at 60°C, and finally a melting curve analysis. Expression of DA receptor subtypes was investigated using following primers (PrimerDesign and Eurogentec): D1 (5′-ACCGAGGATGACAACTGTGA-3′/5′-TAGATACTGGTGTAGGTGACGAT-3′; D2L: 5′-AACCTGAAGACACCACTCAAGGAT-3′/5′-TGCTTGACAGCATCTCCATTTC-3′; D2S: 5′-CCCACCCTGAGGACATGAAA-3′/5′-CCGCCTGTTCACTGGGAA-3′/D4: 5′-TATGTCAACAGTGCCCTCAAC/5′-AGACATCAGCGGTTCTTTCAG-3′;D5: 5′-GGGAGAGGAGGAGGAGGAG-3′/5′-GGGGTGAGAGGTGAGATTTTG-3′. Assays were performed in duplicate and a standard curve from consecutive twofold dilutions of a cDNA pool for the brain areas of interest was included for each quantification. For each sample, the quantification cycle value (Cq) was normalized to two control reference genes (B2m and Ubc) and the relative expression fold change was calculated using the 2−ΔΔ Cqmethod with adult P70 group as control group. Statistical analyses were performed using Student's t test or ANOVAs followed, when required, by Dunnett's post hoc test. Behavioral data were compared using repeated-measures ANOVA with Session and Condition as within-subject factors. Rats grown from adolescents to adults were compared using Age as a within-subject factor. Adult and Control adult groups were compared using Group as a between-subject factor. Analyses were performed using StatView software. The α risk for rejection of the null hypothesis was fixed at 0.05. We first investigated goal-directed behavior of adolescent rats using specific instrumental conditioning tasks. Rats were first trained and tested during the beginning of adolescence (Adolescent, P25 to P40) and then again as adults (Adult, >P70). 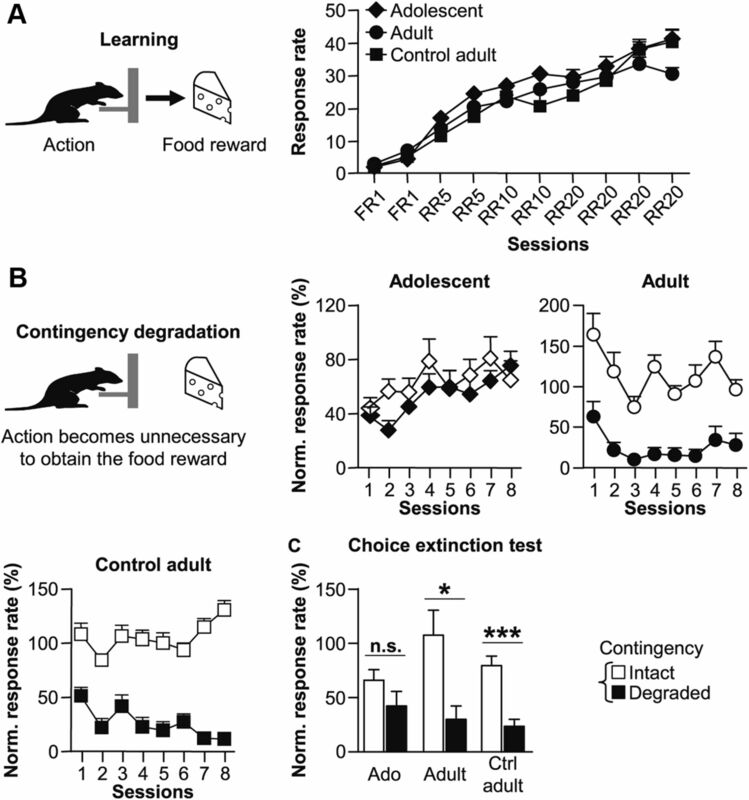 During instrumental training, adolescent and adult rats (n = 8) gradually increased lever pressing rates to obtain food rewards across sessions, as did control rats trained only as adults (Control adult, n = 10; Fig. 1A). No difference was observed between Adolescent and Adult groups (Age: F(1,7) = 3.9, n.s.) nor between Adult and Control adult groups (Group: F(1,16) = 0.05, n.s.). Moreover, the three groups learned the task at the same rate (Session: all F > 45, p < 0.001; Session × Group interaction: all Fs < 1.9, n.s.). Adolescent actions are insensitive to changes in their consequences. A, Acquisition of lever-pressing response during the 10 sessions of instrumental learning for Adolescent (Ado, diamonds), Adult (circles), and Adult Control group (Ctrl adult, squares). B, Evolution of instrumental responses during the eight sessions of contingency degradation when the contingency was maintained (white symbols) or degraded (black symbols). C, Lever-pressing rate during the 5 min choice extinction test between levers associated with the previously intact (white) or degraded (black) contingency. Data are expressed as mean ± SEM relative to the lever-press rate observed during the last session of instrumental training. *p < 0.05, ***p < 0.001, n.s., not significant (one-way ANOVA). The difference in response sensitivity to contingency changes between Adolescent and Adult groups persisted during the subsequent choice extinction test (Fig. 1C). In contrast to adult and control adult animals, adolescent rats presented a clear deficit in their sensitivity to contingency changes, confirming the inability of adolescent rats to use new strategies when action rules changed. Adult and Control adult groups again showed an effect of Contingency (F(1,16) = 16.6, p < 0.001) but no effect of Group (F(1,16) = 3.7, n.s.) nor any interaction (F(1,16) = 0.4, n.s.). Adolescent and Adult groups also showed an effect Contingency (F(1,7) = 8.5, p < 0.05) but with a tendency toward an effect of Age (F(1,7) = 4.2, p = 0.08). Separate ANOVAs confirmed a significant effect of Contingency in the Adult (F(1,7) = 5.4, p < 0.05) and Control adult group (F(1,9) = 19.7, p < 0.001), but not in the Adolescent group (F(1,7) = 1.2, p > 0.1). To test the ability of rats to control their action according to the current outcome value, we trained separate group of rats in an identical instrumental learning task, before reducing outcome value through sensory-specific satiety (Adolescent and adult groups n = 7; Control adult group n = 9; Fig. 2A). As previously observed, all groups learned the task (Session: all F > 29, p < 0.001) without group differences (all Fs > 1.3, n.s.). In contrast to the contingency degradation procedure, adolescent rats were able to correctly adapt their responses according to the current outcome value. 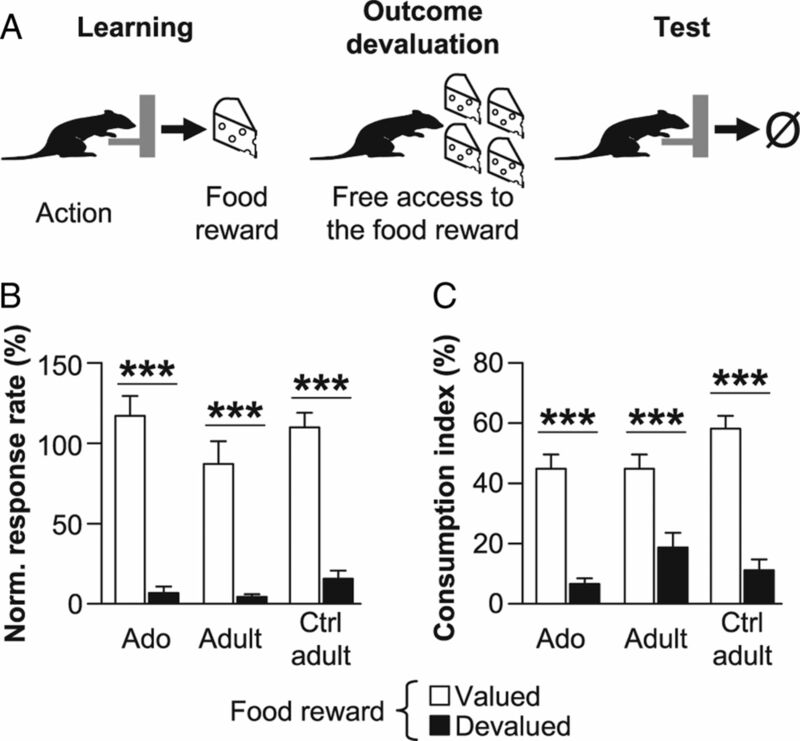 Indeed, when one of the reward values was reduced, both adolescent and adult rats specifically reduced their response on the lever associated with the devalued outcome (Fig. 2B, black bars). ANOVAs revealed a significant effect of Devaluation in each group (Adolescents: F(1,8) = 66.7, p < 0.001; Adults: F(1,8) = 31.9, p < 0.001; Control adults: F(1,6) = 90.5, p < 0.001). Adolescents are able to adapt their actions to changes in reward value. A, After the learning phase (left), rats had free access to one food reward to induce sensory-specific satiety (middle). Immediately after, they performed a test in extinction to assess the impact of the change in outcome value on action selection (right). B, Lever-pressing rate during the 5 min choice extinction test on levers associated with the devalued (black) or nondevalued (white) reward in adolescent (Ado), adult, and control (Ctrl) adult rats. C, Consumption levels of devalued and nondevalued reward during consumption tests for the three groups. Data are expressed as mean ± SEM relative to the lever press rate observed during the last session of instrumental training. n = 9 per group; ***p < 0.001 (two-way ANOVA). Moreover, all rats also correctly discriminated the devalued from the nondevalued food reward on a subsequent consumption test (Fig. 2C). They consumed high quantities of nondevalued reward (white bars) compared with the sated one (black bars), as confirmed by a significant effect of Devaluation in all groups (all Fs > 31.0, p < 0.001). Finally, we tested the impact of a Pavlovian incentive on instrumental responding using a PIT procedure in a separate group of rats (n = 6 per groups; Fig. 3A). During pavlovian conditioning phase, all age groups learned that a tone stimulus predicts the delivery of food reward, as evidenced by the increase in magazine approach behavior during the tone presentation relative to the pretone interval (Fig. 3B). The ANOVA revealed a significant effect of Sessions in both adolescent, adult (F(3,15) = 3.6, p < 0.05), and control adult animals (F(3,5) = 3.7, p < 0.05) but no effect of Age (all Fs < 2.2) nor Age × Session interaction (all Fs < 0.5). Incentive stimuli enhance instrumental actions in adolescent and adult rats. 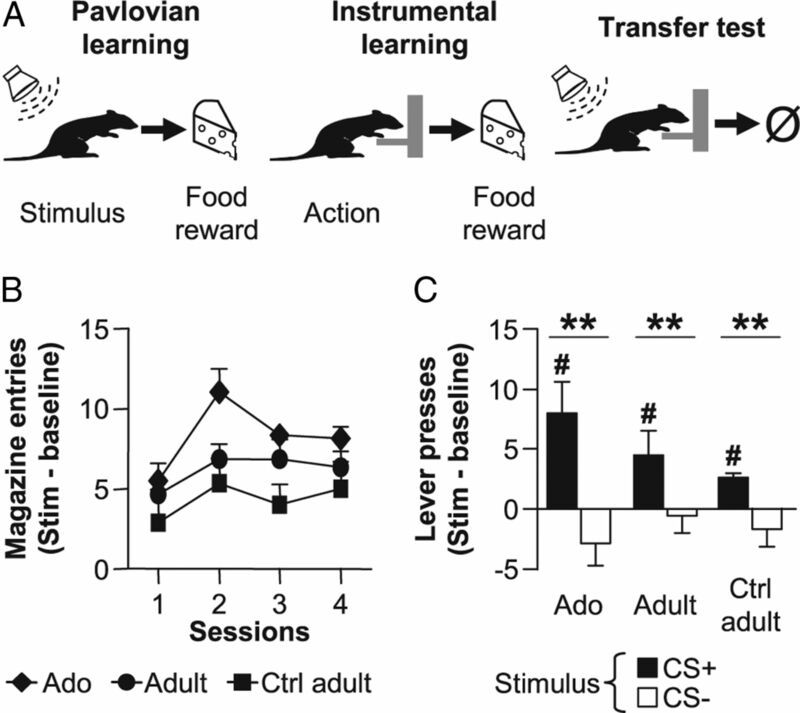 A, Rats learned first to associate the presentation of a tone (pavlovian learning, left) and then the action of lever pressing (instrumental learning, middle) to the delivery of the food reward. During the PIT test (right), pavlovian stimuli were presented to assess their impact on instrumental action. B, Approach behavior during the four sessions of pavlovian conditioning for Adolescent (Ado, diamonds), Adult (circles), and Adult Control group (Ctrl adult, squares). Pavlovian responses are shown as the difference in magazine entries during the stimulus presentation and the prestimulus interval. C, PIT test. Number of lever presses during the presentation of the previously conditioned stimulus (CS+, black) or a different auditory stimulus (CS−, white) compared with prestimulus intervals. Data are expressed as mean ± SEM. n = 6 per group; **p < 0.01 versus response to the different stimulus (two-way ANOVA), #p < 0.05, ###p < 0.001 versus response baseline (Student's t test). During the PIT test, the food-predicting stimulus (black bars, CS+) markedly enhanced instrumental performance test in both Adolescent, Adult, and Control adult groups as compared with a nonpredicting stimulus (CS−, white bars; Fig. 3C). Statistical analyses revealed a significant effect of Stimulus (F(1,5) = 17.3, p < 0.01 and F(1,10) = 9.8, p < 0.05), independently of Age or Groups (all Fs < 1). A more detailed analysis revealed a significant increase of instrumental response relative to baseline responding only during the presentation of the food-predicting stimulus CS+ (Adolescents: t(5) = 3.0, p < 0.05; Adults: t(5) = 2.9, p < 0.05; Control adults: t(5) = 8.0, p < 0.001; Student's t test). Despite a seemingly higher response level in Adolescent group during the presentation of CS+, no significant difference was observed between Adolescent and Adult (Age: F(1,5) = 0.9; n.s.) nor between Adult and Control adult groups (Group: F(1,10) = 0.8; n.s.). In contrast, the nonpredicting stimulus CS− did not affect responding (white bars; all t(5) < 1.12, n.s.). Altogether, these results shed new light on the specific cognitive maturational processes that take place during adolescence. Whereas value-based decision making seems already mature in adolescent rats, the ability to adapt actions according to their causal status is not present during adolescence and only appears in adult subjects. We first quantified the density of TH-immunoreactive fibers in juvenile (P25), early (P30), and late (P45) adolescent rats in comparison with adult rats (P70, n = 4–8 per group). 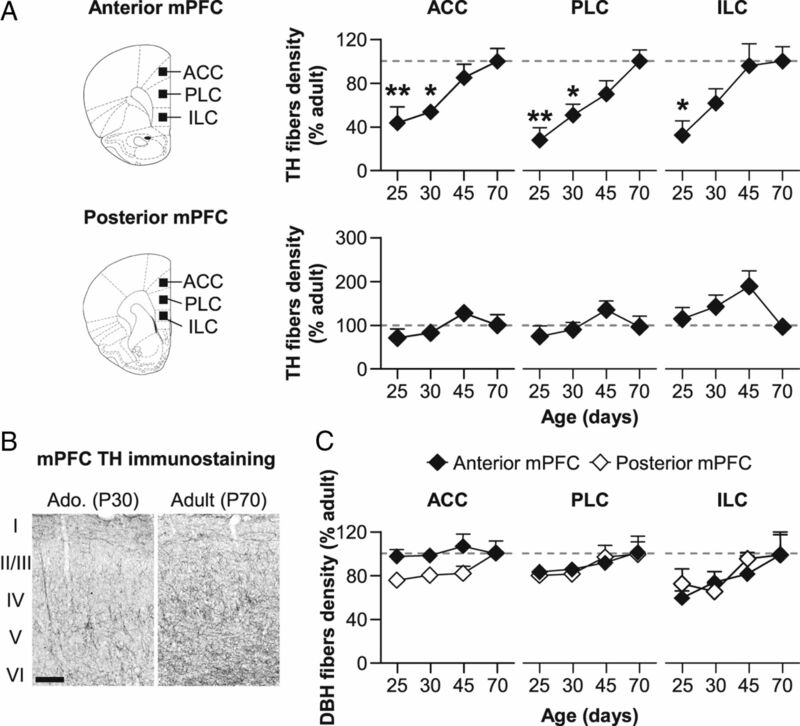 In medial prefrontal cortex (mPFC), the density of TH-immunoreactive fibers gradually increased across adolescence in the ACC, PLC, and ILC cortices (Fig. 4A,B). This increase mostly occurred in the anterior part of the prefrontal cortex (one-way ANOVA with anteroposterior level as factor: ACC: F(1,15) = 12.3, p < 0.01; PLC: F(1,15) = 19.4, p < 0.001; ILC: F(1,15) = 35.2, p < 0.001), suggesting the existence of an anteroposterior gradient in the development of the PFC. Separate analyses revealed a significant effect of Age in the anterior part of the mPFC (ACC: F(3,15) = 5.5, p < 0.01; PLC: F(3,15) = 7.2, p < 0.01; ILC: F(3,15) = 19.4, p < 0.05) but not in the posterior part (ACC: F(3,15) = 1.8, n.s. ; PLC: F(3,15) = 1.3, n.s. ; ILC: F(3,15) = 2.0, n.s.). Development of DA and norepinephrine fiber density in the mPFC during adolescence. A, Density of TH-immunostained fibers in the anterior (top) and posterior part (bottom) of the mPFC (including ACC, PLC, and ILC) in juvenile (P25), early (P30), and late (P45) adolescent and adult (P70) rats. B, Representative microphotographs of TH immunostaining in superficial and deep layers (I to VI) of the PLC for adolescent (P30) and adult (P70) rats. Scale bar, 200 μm. C, Density of DBH-immunostained fibers in the anterior (black symbols) and posterior part (white symbols) of the mPFC. All data are expressed as mean ± SEM relative to adult (P70) group (dotted lines). n = 4–8 per group; *p < 0.05, **p < 0.01 versus P70 (one-way ANOVA followed by Dunnett's post hoc test). As TH immunostaining characterizes both DA fibers and noradrenergic fibers, we next used dopamine β-hydroxylase (DBH) immunostaining to evaluate the possible development of the prefrontal noradrenergic innervation (Fig. 4C). Unlike DA innervation, noradrenergic fiber density in the mPFC remained stable from juvenile to adult stage in both anterior and posterior areas of the mPFC. This was confirmed by a two-way ANOVA that revealed no significant effect of Age (ACC: F(3,15) = 2.3, n.s. ; PLC: F(3,15) = 0.7, n.s. ; ILC: F(3,15) = 0.9, n.s.) nor Age × Anteroposterior level interaction (ACC: F(3,15) = 0.4, n.s. ; PLC: F(3,15) = 0.4, n.s. ; ILC: F(3,15) = 1.1, n.s.). These results therefore indicate that the previously observed increase in TH-immunoreactive fibers in prefrontal areas during adolescence reflects the important development of DA mesocortical pathway. We next quantified in the same animals the density of TH-immunoreactive fibers in DMS/DLS and NAc to evaluate the development of nigrostriatal and mesolimbic pathways. In contrast of prefrontal areas, TH fiber density reached adult levels much earlier in dorsal and ventral striatal areas (Fig. 5). Indeed, juvenile rats (P25) already present a density of DA fibers similar to that of the adult group (P70). This was confirmed by statistical analyses showing no effect of Age in DMS (F(3,15) = 0.5, n.s. ), DLS (F(3,15) = 0.1, n.s. ), or NAc (F(3,15) = 0.4, n.s.). Density of DA fibers in striatal areas during adolescence. Quantification of TH-immunostained fibers in the DMS and DLS and the NAc in juvenile (P25), early (P30), and late (P45) adolescent and adult (P70) rats. Representative microphotographs of TH immunostaining in dorsal striatum of adolescent (P30) and adult (P70) rats. All data are expressed as mean ± SEM relative to adult (P70) group (dotted lines). n = 4–8 per group. To determine whether the increase in TH immunoreactive fibers during adolescence was correlated with changes in DA content, we next investigated concentration in DA and its metabolism (dihydroxyphenylacetic acid; DOPAC and homovanillic acid; HVA) in prefrontal and striatal areas using HPLC-ED (n = 6–8 per group). Consistent with the gradual development of DA fibers reported in prefrontal areas, DA levels in the mPFC appeared significantly lower in juvenile and adolescent animals compared with adults (Age: F(3,26) = 23.7, p < 0.001; Fig. 6A). This concentration steadily increased between the juvenile (P25) and late adolescence stage (P45) and presented a dramatic rise between the end of adolescence and adulthood (Dunnett's post hoc test, p < 0.01). 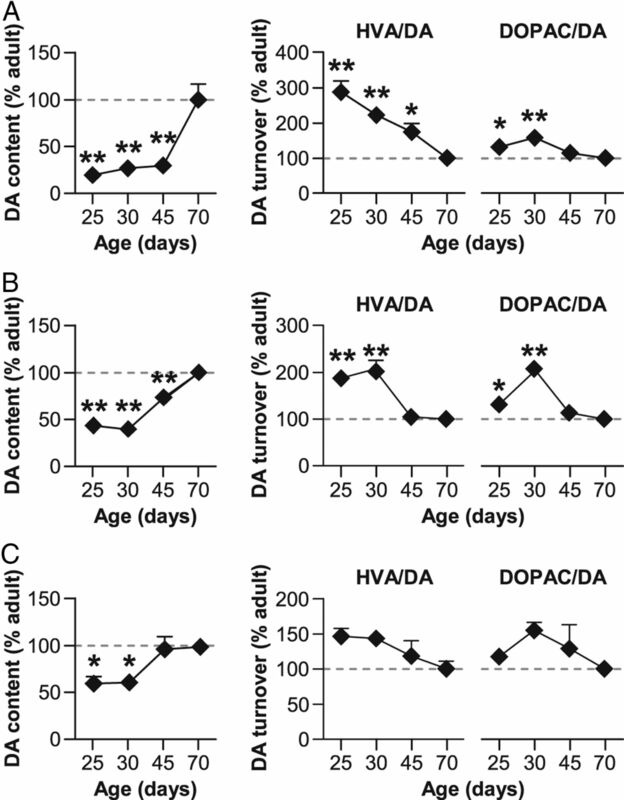 Interestingly, HVA/DA and DOPAC/DA ratios reflecting the relative rate of DA degradation appeared more important in young rats and progressively decreased (Age effect; HVA/DA: F(3,26) = 9.7, p < 0.001; DOPAC/DA: F(3,26) = 5.4, p < 0.01). This parallel decrease in DA turnover ratios may contribute to the general increase in DA availability reported above. Changes in DA availability in prefrontal and striatal regions during adolescence. HPLC quantification of DA content (left) and DA metabolites/DA ratios (HVA/DA and DOPAC/DA; right) in mPFC (A), dorsal striatum (B), and NAc (C) for juvenile (P25), early (P30), and late (P45) adolescent and adult (P70) rats. All data are expressed as mean ± SEM relative to adult (P70) group (dotted lines). n = 6–8 per group; *p < 0.05, **p < 0.01 versus P70 (one-way ANOVA followed by Dunnett's post hoc test). Similarly to the development of DA innervation, changes in DA tissue content were more precocious in dorsal striatum and NAc than in cortical region (Fig. 6B,C). 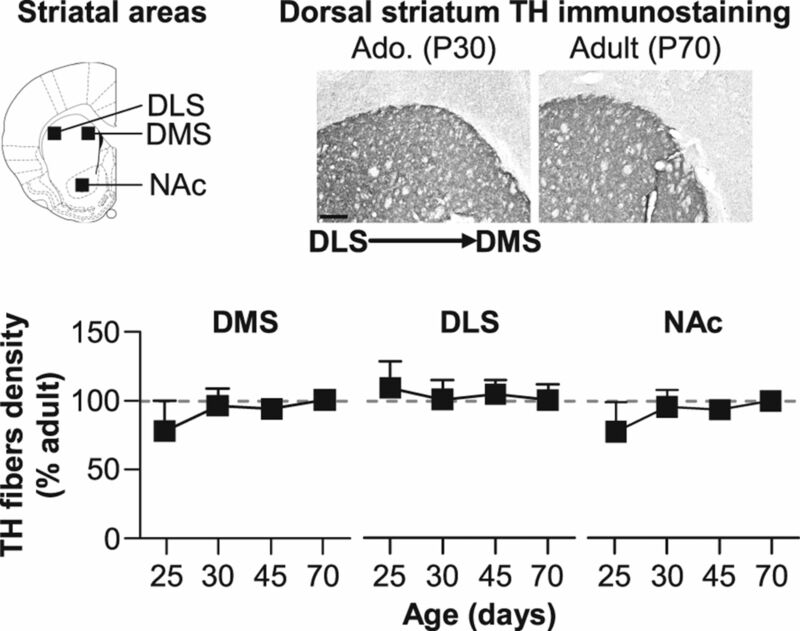 Indeed, DA concentration increased in dorsal striatum (Age: F(3,26) = 27.3, p < 0.001) and NAc (Age: NAc: F(3,26) = 5.9, p < 0.01) until late adolescence (P45), where it reached adult levels (Dunnett's post hoc test, n.s.). Moreover, the decrease in HVA/DA and DOPAC/DA ratios also appeared more rapidly in dorsal (Age effect; HVA/DA: F(3,26) = 19.8, p < 0.001; DOPAC/DA: F(3,26) = 9.2, p < 0.01; Dunnett's post hoc test, p < 0.05 for P25 and P30 group) and ventral (HVA/DA: F(3,26) = 2.0, n.s. ; DOPAC/DA: F(3,26) = 1.3, n.s.) striatal areas than in the mPFC. We finally explored the changes in expression of D1-like (D1 and D5) and D2-like (D2L [long] and D2S [short] isoforms and D4) postsynaptic receptors in DA projection areas using qPCR (n = 6 per group). Compared with adult P70 rats, juvenile and adolescent rats exhibited overall higher expression of DA receptors mRNA in the mPFC (D1: F(3,20) = 3.0, p < 0.05; D5: F(3,20) = 3.1, p < 0.05; D2L: F(3,20) = 3.0, p < 0.05; D4: F(3,20) = 5.9, p < 0.01), as the notable exception of D2S (F(3,20) = 1.8, n.s. ; Fig. 7A). Moreover, these receptor subtypes presented an important peak of expression during late adolescence (P45; Dunnett's post hoc test, p < 0.05). Interestingly, a similar expression profile was observed in the dorsal striatum (D1: F(3,20) = 6.4, p < 0.01; D5: F(3,20) = 6.6, p < 0.01; D2L: F(3,20) = 4.6, p < 0.05; D2S: F(3,20) = 3.0, p < 0.05; D4: F(3,20) = 4.7, p < 0.05; Figure 7B) despite the differences between the two brain areas concerning the time course of the development of DA innervation and DA tissue content (see above). Contrastingly, changes in the expression of DA receptors appeared more precociously in the NAc. Indeed, the expression peak seems to occur during early adolescence (P30), although statistical analyses revealed no significant effect of Age for all receptor subtypes (D1: F(3,20) = 1.1, n.s. ; D5: F(3,20) = 2.0, n.s. ; D2L: F(3,20) = 2.4, n.s. ; D2S: F(3,20) = 2.5, n.s. ; D4: F(3,20) = 0.3, n.s. ; Figure 7C). Changes in the expression of DA receptors in prefrontal and striatal regions during adolescence. Mean fold change of expression levels of DA receptors mRNA (D1/D5 and D2L [long]/D2S [short]/D4) quantified by qPCR in mPFC (A), dorsal striatum (B), and NAc (C) for juvenile (P25), early (P30), and late (P45) adolescent relative to adult (P70) rats. All data are expressed as mean ± SEM. n = 6 per group; *p < 0.05, **p < 0.01 versus P70 (one-way ANOVA followed by Dunnett's post hoc test). In the present study, we observe a comparable time course for both the development of the DA system and the maturation of goal-directed behavior. Indeed, the adult subjects' ability to select and execute actions according to their predicted consequences is associated with the late maturation of the DA mesocortical pathway during adolescence. Consistent with the remarkable topographic organization of DA cell populations within midbrain areas according to their projection areas reported in adult (Björklund and Dunnett, 2007; Lammel et al., 2008), we reveal here a dissociation in the developmental time course of DA pathways during adolescence. The gradual increase in DA fiber density throughout adolescence and until the adult age observed in prefrontal areas contrasts with the more rapid maturation of fibers of both nigrostriatal and mesolimbic pathways. By extending previous studies, which suggested a differential development of DA pathways during postnatal life (Kalsbeek et al., 1988; Voorn et al., 1988; Rosenberg and Lewis, 1994, 1995), our findings point to the fact that this development occurs mainly in the anterior portion of the mPFC. The differential dynamics of DA axon growth between prefrontal and striatal areas during adolescence suggests the existence of complex processes regulating fibers trajectories. While several studies demonstrate that DA axonal path finding is tightly regulated by specific ligand-receptor complexes during fetal life (Smidt and Burbach, 2007), these processes in the adolescent brain are still an emerging issue. Recent reports nevertheless indicate that a shift in the interaction between the axon-guidance factor Netrin-1 and its different receptors during adolescence might underlie the late establishment of the DA mesocortical pathway (Manitt et al., 2011). Importantly, we show that DA system development during adolescence is also characterized by a steady increase in DA tissue content in projection areas, concurrently with a marked overexpression of postsynaptic DA receptors. DA tissue content increases dramatically in the mPFC and dorsal striatum during late adolescence (P45 until adulthood), while the expression of both D1- and D2-like receptors peaks. These late neurobiological changes in prefrontal and dorsal striatal areas contrast with the earlier maturation observed in the nucleus accumbens, as previously reported by more traditional autoradiography techniques (Teicher et al., 1995; Andersen et al., 2000). The regulation of the expression of DA receptors is a complex issue. However, it may be noted that the decrease in prefrontal DA receptor expression during late adolescence coincides with a period of maximal availability of DA as well as of highest spontaneous firing of DA cells (McCutcheon and Marinelli, 2009). It is therefore possible that increased DA levels contribute to downregulate DA receptor expression, as previously demonstrated with drug exposure (Nader et al., 2006) or genetic deletion of DAT (Giros et al., 1996). The reduction in the expression of DA receptors in the prefrontal cortex might also reflect the general synaptic overproduction and subsequent pruning that have consistently been reported in cortical areas during adolescence in humans (Giedd et al., 1999), nonhuman primates (Bourgeois et al., 1994), and rodents (Juraska and Markham, 2004). The dramatic neurodevelopmental changes in the DA system differentially impact reward-related and goal-directed control processes. We first evaluated motivational processes, which are an important component of goal-directed behavior. In particular, pavlovian learning of stimulus values directly contributes to the selection of instrumental actions by enhancing responses leading to a particular reward. In the present study, we demonstrate in a PIT procedure (Holmes et al., 2010) that, in adolescent animals, a learned pavlovian incentive cue can enhance instrumental responding. This result confirms that the neural circuitry of PIT, which involves limbic areas such as the NAc (Corbit et al., 2001; Lex and Hauber, 2008), the amygdala (Corbit and Balleine, 2005; Balleine and Killcross, 2006), and the orbitofrontal cortex (Ostlund and Balleine, 2007) is already mature at adolescence. These results therefore strongly suggest that value computation and learning processes associated with the phasic activity of midbrain DA cells projecting to striatal areas (Schultz, 2000; Day et al., 2007) mature before the onset of adolescence, a conclusion supported by our observation of the early development of mesolimbic and nigrostriatal DA pathway. Action performance also depends on the representation of action value. Previous work has demonstrated that this representation involves both the mPFC (Killcross and Coutureau, 2003; Valentin et al., 2007; Tran-Tu-Yen et al., 2009) and the dorsomedial part of the striatum (Yin and Knowlton, 2006; Tanaka et al., 2008), but does not require the dopaminergic system (Naneix et al., 2009; Lex and Hauber, 2010a, b). Accordingly, we observed here that adolescent animals were able to adapt their action to changes in reward value induced by sensory-specific satiety. Furthermore, we did not observe any effect of age on food consumption behavior following sensory-specific satiety, in agreement with the view that motivational aspects of value attribution are already mature at adolescence. In contrast, when tested in a contingency degradation procedure, we demonstrate here that the subjects fail to adapt their response to changes of action–outcome relationships as adolescents, but succeed once adults. Importantly, this pattern of results cannot be attributed to a general lack of inhibitory control since adolescent animals were able to reduce their lever pressing in the devaluation test. This change in the ability of control instrumental actions therefore appears as an essential aspect of the cognitive maturation taking place during adolescence. In the adult, previous research has demonstrated that this process depends upon the integrity of the mPFC (Corbit and Balleine, 2003; Dalley et al., 2004; Coutureau et al., 2012). In addition, we recently showed that lesions or pharmacological alterations of mesocortical DA functioning result in a deficit in adaptation to contingency changes (Naneix et al., 2009). As a consequence, the striking parallel between goal-directed behavior and mesocortical DA maturation likely reflects the dependence of this cognitive process upon the existence of a fully mature DA system. The maturation of DA systems is likely to have significant physiological consequences since DA acts as an important neuromodulator of the excitation/inhibition balance. During adolescence, major changes occur in DA-dependent modulation of prefrontal activity. Both D1-NMDA-dependent plateau depolarization of pyramidal cells and D2-mediated recruitment of local GABA interneurons emerge in postadolescent animals (Tseng and O'Donnell, 2005,, 2007a, b). This maturation should determine the ability of prefrontal pyramidal neurons to maintain a sustained activity and improve signal-to-noise ratio (Seamans and Yang, 2004; Durstewitz and Seamans, 2008), thereby possibly facilitating the encoding of stable task rules (Floresco and Magyar, 2006). In situations requiring shifting between instrumental rules, DA release in the mPFC has been shown to be positively correlated to the rapidity of shift as well as with uncertainty about reward delivery (Stefani and Moghaddam, 2006). Similarly, during contingency changes, the delivery of nonexpected rewards is likely to induce a DA-dependent reward prediction error signal (Schultz, 2000; Montague et al., 2004). Altogether, these results suggest that detection of rule shifts and contingency changes requires both a stable encoding of prior contingencies and prefrontal DA-dependent error signals, both functions impaired under conditions of reduced mesocortical DA function. Furthermore, the DA-dependent modulation of corticostriatal networks (Costa, 2007) also presents a delayed development (Galiñanes et al., 2009; Sturman and Moghaddam, 2011a, 2012) and can underlie the maturation of higher cognitive functions such as the orchestration of brain areas according to rules and goal (Miller and Cohen, 2001). In summary, this study highlights the differential maturation of DA projection systems during adolescence, which influences the cognitive maturation during the transition to adulthood. The late timing of development of the mesocortical DA pathway appears to affect a specific aspect of decision making that resembles causal reasoning. It is likely that this neural maturation will determine the late emergence of distinctive frontal-dependent abilities, such as those requiring processing rather than simple maintenance of information in working memory (Hooper et al., 2004; Conklin et al., 2007). Our data support recent models attributing adolescent-specific behaviors to the delayed development of prefrontal-related cognitive processes of action control with respect to striatal-dependent motivational processes (Casey et al., 2008; Ernst et al., 2009; Geier and Luna, 2009; Sturman and Moghaddam, 2011b). In humans, such a differential maturation of cognitive function could account for the gradual emergence of an essential cognitive feature of adulthood, namely abstract reasoning. Furthermore, deficits in the representation of action consequences observed during adolescence might underlie risk-taking behaviors such as heavy binge drinking or exposure to drug of abuse (Spear, 2000; Laviola et al., 2003) that can alter brain development (Carlezon and Konradi, 2004). Since a number of major psychiatric disorders emerge during adolescence (Paus et al., 2008), our results should constitute an important step toward the understanding of normal and pathological development trajectories. This work is supported by the Centre National de la Recherche Scientifique (CNRS) (PIR Neuroinformatique and PEPII) and the Conseil Régional d'Aquitaine. F.N. is supported by the Ministère de l'Enseignement Supérieur and by the Fondation pour la Recherche Médicale. We thank Drs. N. Kaouane, C. Le Moine, E. Procyk, and R. Jaffard for helpful discussions; G. Courtand, A. Faugère, D. Panzeri, N. Argenta, and J. Huard for technical help; and Dr. S. Parrot from NeuroChem facility (Centre de Recherche en Neurosciences de Lyon, INSERM U1028-CNRS UMR5292, Université Claude Bernard Lyon 1, France) for neurochemical analyses. (2000) Dopamine receptor pruning in prefrontal cortex during the periadolescent period in rats. Synapse 37:167–169. (2006) Parallel incentive processing: an integrated view of amygdala function. Trends Neurosci 29:272–279. (2010) Human and rodent homologies in action control: corticostriatal determinants of goal-directed and habitual action. Neuropsychopharmacology 35:48–69. (2007) Dopamine neuron systems in the brain: an update. Trends Neurosci 30:194–202. (1994) Synaptogenesis in the prefrontal cortex of rhesus monkeys. Cereb Cortex 4:78–96. (2010) Dopamine in motivational control: rewarding, aversive, and alerting. Neuron 68:815–834. (2004) Understanding the neurobiological consequences of early exposure to psychotropic drugs: linking behavior with molecules. Neuropharmacology 47(Suppl 1):47–60. (2008) The adolescent brain. Dev Rev 28:62–77. (2007) Working memory performance in typically developing children and adolescents: behavioral evidence of protracted frontal lobe development. Dev Neuropsychol 31:103–128. (2003) The role of prelimbic cortex in instrumental conditioning. Behav Brain Res 146:145–157. (2005) Double dissociation of basolateral and central amygdala lesions on the general and outcome-specific forms of pavlovian-instrumental transfer. J Neurosci 25:962–970. (2001) The role of the nucleus accumbens in instrumental conditioning: evidence of a functional dissociation between accumbens core and shell. J Neurosci 21:3251–3260. (2007) Plastic corticostriatal circuits for action learning: what's dopamine got to do with it? Ann N Y Acad Sci 1104:172–191. (2012) The role of the rat medial prefrontal cortex in adapting to changes in instrumental contingency. PLoS One 7:e33302. (2004) Prefrontal executive and cognitive functions in rodents: neural and neurochemical substrates. Neurosci Biobehav Rev 28:771–784. (2007) Associative learning mediates dynamic shifts in dopamine signaling in the nucleus accumbens. Nat Neurosci 10:1020–1028. (2008) The dual-state theory of prefrontal cortex dopamine function with relevance to catechol-o-methyltransferase genotypes and schizophrenia. Biol Psychiatry 64:739–749. (2009) Neurobiology of the development of motivated behaviors in adolescence: a window into a neural systems model. Pharmacol Biochem Behav 93:199–211. (2005) Lesion to the nigrostriatal dopamine system disrupts stimulus-response habit formation. J Neurosci 25:2771–2780. (2006) Mesocortical dopamine modulation of executive functions: beyond working memory. Psychopharmacology 188:567–585. (2009) Dopamine-dependent periadolescent maturation of corticostriatal functional connectivity in mouse. J Neurosci 29:2496–2509. (2009) The maturation of incentive processing and cognitive control. Pharmacol Biochem Behav 93:212–221. (1999) Brain development during childhood and adolescence: a longitudinal MRI study. Nat Neurosci 2:861–863. (1996) Hyperlocomotion and indifference to cocaine and amphetamine in mice lacking the dopamine transporter. Nature 379:606–612. (2007) Bidirectional modulation of goal-directed actions by prefrontal cortical dopamine. Cereb Cortex 17:2820–2827. (2010) Pavlovian to instrumental transfer: a neurobehavioural perspective. Neurosci Biobehav Rev 34:1277–1295. (2004) Adolescents' performance on the Iowa Gambling Task: implications for the development of decision making and ventromedial prefrontal cortex. Dev Psychol 40:1148–1158. (2004) The cellular basis for volume changes in the rat cortex during puberty: white and gray matter. Ann N Y Acad Sci 1021:431–435. (1988) Development of the dopaminergic innervation in the prefrontal cortex of the rat. J Comp Neurol 269:58–72. (2003) Coordination of actions and habits in the medial prefrontal cortex of rats. Cereb Cortex 13:400–408. (2008) Unique properties of mesoprefrontal neurons within a dual mesocorticolimbic dopamine system. Neuron 57:760–773. (2003) Risk-taking behavior in adolescent mice: psychobiological determinants and early epigenetic influence. Neurosci Biobehav Rev 27:19–31. (2008) Dopamine D1 and D2 receptors in the nucleus accumbens core and shell mediate Pavlovian-instrumental transfer. Learn Mem 15:483–491. (2010a) The role of nucleus accumbens dopamine in outcome encoding in instrumental and Pavlovian conditioning. Neurobiol Learn Mem 93:283–290. (2010b) The role of dopamine in the prelimbic cortex and the dorsomedial striatum in instrumental conditioning. Cereb Cortex 20:873–883. (2011) The netrin receptor DCC is required in the pubertal organization of mesocortical dopamine circuitry. J Neurosci 31:8381–8394. (2009) Age matters. Eur J Neurosci 29:997–1014. (2001) An integrative theory of prefrontal cortex function. Annu Rev Neurosci 24:167–202. (2004) Computational roles for dopamine in behavioural control. Nature 431:760–767. (2006) PET imaging of dopamine D2 receptors during chronic cocaine self-administration in monkeys. Nat Neurosci 9:1050–1056. (2009) A role for medial prefrontal dopaminergic innervation in instrumental conditioning. J Neurosci 29:6599–6606. (2007) Orbitofrontal cortex mediates outcome encoding in Pavlovian but not instrumental conditioning. J Neurosci 27:4819–4825. (2011) A rapid and sensitive method for the analysis of brain monoamine neurotransmitters using ultra-fast liquid chromatography coupled to electrochemical detection. J Chromatogr B Analyt Technol Biomed Life Sci 879:3871–3878. (2008) Why do many psychiatric disorders emerge during adolescence? Nat Rev Neurosci 9:947–957. (1998) The rat brain in stereotaxic coordinates (Academic, San Diego), Ed 4. (2006) The short-latency dopamine signal: a role in discovering novel actions? Nat Rev Neurosci 7:967–975. (1994) Changes in the dopaminergic innervation of monkey prefrontal cortex during late postnatal development: a tyrosine hydroxylase immunohistochemical study. Biol Psychiatry 36:272–277. (1995) Postnatal maturation of the dopaminergic innervation of monkey prefrontal and motor cortices: a tyrosine hydroxylase immunohistochemical analysis. J Comp Neurol 358:383–400. (2000) Multiple reward signals in the brain. Nat Rev Neurosci 1:199–207. (2004) The principal features and mechanisms of dopamine modulation in the prefrontal cortex. Prog Neurobiol 74:1–58. (2007) How to make a mesodiencephalic dopaminergic neuron. Nat Rev Neurosci 8:21–32. (2010) Developmental neurobiology of cognitive control and motivational systems. Curr Opin Neurobiol 20:236–241. (2000) The adolescent brain and age-related behavioral manifestations. Neurosci Biobehav Rev 24:417–463. (2006) Rule learning and reward contingency are associated with dissociable patterns of dopamine activation in the rat prefrontal cortex, nucleus accumbens, and dorsal striatum. J Neurosci 26:8810–8818. (2011a) Reduced neuronal inhibition and coordination of adolescent prefrontal cortex during motivated behavior. J Neurosci 31:1471–1478. (2011b) The neurobiology of adolescence: changes in brain architecture, functional dynamics, and behavioral tendencies. Neurosci Biobehav Rev 35:1704–1712. (2012) Striatum processes reward differently in adolescents versus adults. Proc Natl Acad Sci U S A 109:1719–1724. (2008) Calculating consequences: brain systems that encode the causal effects of actions. J Neurosci 28:6750–6755. (1995) Evidence for dopamine receptor pruning between adolescence and adulthood in striatum but not nucleus accumbens. Brain Res Dev Brain Res 89:167–172. (2009) Transient role of the rat prelimbic cortex in goal-directed behaviour. Eur J Neurosci 30:464–471. (2005) Post-pubertal emergence of prefrontal cortical up states induced by D1-NMDA co-activation. Cereb Cortex 15:49–57. (2007a) D2 dopamine receptors recruit a GABA component for their attenuation of excitatory synaptic transmission in the adult rat prefrontal cortex. Synapse 61:843–850. (2007b) Dopamine modulation of prefrontal cortical interneurons changes during adolescence. Cereb Cortex 17:1235–1240. (2007) Determining the neural substrates of goal-directed learning in the human brain. J Neurosci 27:4019–4026. (1988) The pre- and postnatal development of the dopaminergic cell groups in the ventral mesencephalon and the dopaminergic innervation of the striatum of the rat. Neuroscience 25:857–887. (2006) The role of the basal ganglia in habit formation. Nat Rev Neurosci 7:464–476.